The new generation of turbocharged engines replacing almost everything that was previously naturally aspirated, left some people feeling like the glory days of cars were over. Downsizing, shrinking engines being pepped up with a bolt on turbo to help bridge the capacity gap looked like they would be underwhelming and lacklustre. Moans of huge amounts of laaaaag and no power until way up in the rpm band were? well? were completely misplaced. The majority of the new turbo engines are great, with some of them standing head and shoulders above the rest. The M5 V8 F-series is a perfect example of this. The factory tuning power and torque figures on the standard car are nothing to be scoffed at as the car can easily light the tyres up in first and second and will no doubt have more power than most people will even come close to using. But for the select few petrol heads out there who know their cars, there is a huge untapped potential within this engine for performance upgrades, engine tuning and performance remapping. BMW M5 Tuning will deliver upwards of 50hp and 100nm of torque can be easily extracted from this engine with a Viezu performance remap, and when we say extracted, we really mean restored. Viezu Technologies performance tuning is carefully crafted to restore the locked away power hiding within the engines central control system, the ECU (Engine Control Unit). Extracting the BMW M5 ECUs is no mean feat. Although they are easily accessible in the vehicle, yes that?s right there are two ECU?s in this car, they are plumbed into the vehicles cooling system in order to keep the temperatures in these highly complex electronic control circuits from overheating. Which is a necessity when you consider not only the amount of data and calculations they have to make every millisecond generates a lot of heat, which is compounded by the fact that the ECUs sit on top of the two huge TURBOs! But for Viezu Technologies this was not an issue. With some simply tools and a few minutes work, the M5 ECUs were safely removed from the vehicle with no coolant leak from the system. Making the car ready for a simple and straightforward reinstall after they have been tuned with the high performance Viezu remap. The Viezu Technical team were then able to connect to the ECU on the bench and pull the necessary data from the ECU required for tuning. Obtaining the data in a way that results in as little disturbance to the ECU itself. The data is quickly copied out of the ECU and into Viezu's BMW M5 remap software allowing for the tuning modifications to be made to restore the engine power and torque that the BMW engineers had creatively hidden away. Restoring the vehicles true potential mapping software and unleashing the full, yet safe and reliable, power from the engine is the key to this amazing tuning file. This is what the Viezu Technologies performance remap tuning software is all about. With the modifications made to the software coding of the ECU it is time to program the remapped data file back into the engine control units. When the programming is all said and done the ECUs are sealed with special heat and water resistant silicone and installed back into the car, as if they had never been removed in the first place. The BMW M5 is then ready to rock and roll. The torque delivery of the Viezu M5 tune is phenomenal! 100nm + of torque increase at points in the RPM band and over 40hp+ at the wheels. The car on the road was ferociously fast running the performance tuning software file from Viezu. There is enough torque to smoke the tyres in third gear at almost any given rpm and even a little on the change into fourth gear. The traction control and stability systems do an amazing job and keeping all of the power and the car on the road. The driver even reported that in normal drive mode there is so much torque under the right foot that you only need to breathe on it for the car to take of instantaneously. 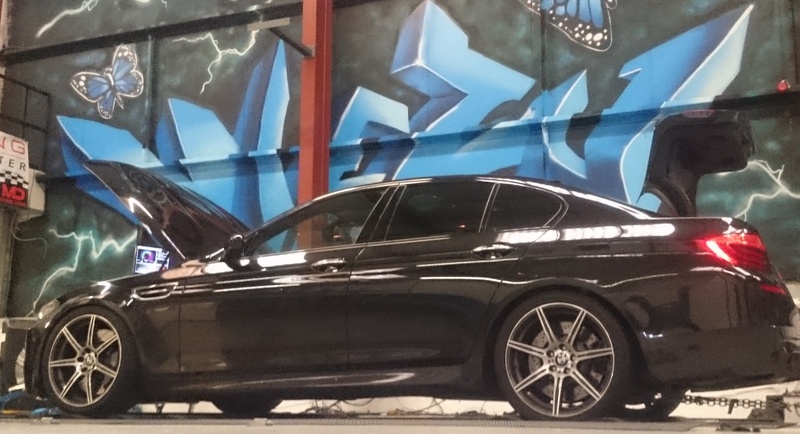 If you own a BMW M5 twin turbo S63 then you need to have this Viezu Performance remap carried out on your car. The car is truly transformed afterwards and you will be amazed at how you ever enjoyed the car without this much smooth power torque that the Viezu Tuning provides.